Like this entry, very handy, insightful and interesting. Keep up the good work and all the best to you! After being in Central America, and Nicaragua in particular, for a year now, I would say satellite internet would be pretty close to heaven! Thanks for the info .. I will check this out further. Adventures are just meant to be had!! Hi again Tropicat – your blog is a lovely resource for people in my position that are considering relocating to a more sustainable lifestyle in the midst of all this chaos. My primary question is how much does your internet service cost each month? more generally, if a family is really diligent about being self-sufficient, to the point of living off the land as much as possible and employing sustainable equipment (like a bidet! ), how much cash can you expect to need monthly or annually? I am attempting to compute a budget and I find it is quite tricky. For internet access, we subscribe through eBlueHost (http://www.ebluehost.com/satellite/index.php) to the lowest package, which is $60 US a month. Hi Tropicat! I’ve been reading your postings and found them so very useful Thank you for doing this! 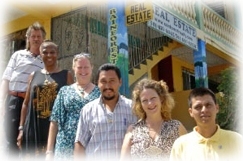 We will be moving to Belize (Stann Creek – in the rainforest) by the end of the Summer. It took 3 years to have our little menonite house built – primarily the problem, as you know, is that we were not there to oversee. In any case, we plan to purchase a satellite to get Internet access and phone. I know you suggest contacting Harry – Spanish Lookout is very far from where we will live. Would you know the exact type of satellite that we need to purchase? I would like to bring it with me and have someone down there install it. Would very much appreciate your/any suggestions. By the way, your home looks like paradise… why are you leaving Belize? Just curious… Have a great day! Our satellite dish is a .92 meter, and is DirecWay (Hughes bought DirecWay). Your subscription will have to be through the Hughes Network, so therefore you want a dish that will be compatible with their receiver. I would not suggest going smaller than .92 meter because Belize is located on the outer edge of the satellite footprint, and the signal strength is weaker. For the modem, you want to go no less than the HN7000S. There are a number of bigger ones (HN9000) but they are for specific uses. Basically you want the latest version of the standard ‘home’ modem, as just like computers, they become obsolete way too fast! I would also check with a local broker in regard of bringing in a satellite dish. In some posts of the Belize Forum, I believe they mention that to import a satellite dish you are require some type of permit…? I know computer ranch does installations throughout the country, so I am sure they also go to Stann Creek. Hope you can make sense of my explanation on the satellite. I am not sure if I used the proper technical terms…! If you have any other questions, I’ll be glad to help as best I can. Very well written post. Thanks for sharing this article. The nice thing about broadband internet is that it gets cheaper and has many ways to access to the internet. Also, check in your town those who have satellite dish on their property and ask them what services they use. Those who are currently and actively using satellite internet in your town would be the best referrals. I would like to know more information about solar panels an where I may get them?